We created this guide in collaboration with Charlotte Døvle, a Norwegian travel blogger and graphic designer who splits her time between Oslo and Krakow. We’re thrilled to welcome her as our local city expert for this Where to Stay in Krakow Guide. Disclosure: This Where to Stay in Krakow Guide contains affiliate links. That means we may earn a small commission when you use the links on this site to book a hotel, buy your travel insurance, etc.. You don’t pay anything extra. If you’d like to learn more about how this works, you can read more under our Disclaimer page. According to the legends, Kraków was founded by a prince who defeated the Wawel Dragon and built a castle on top of its cave. Whether or not you believe in legends, it’s hard to deny the mythical atmosphere of Kraków’s beautiful old streets and squares. Miraculously overcoming war and a communist regime, Kraków today is a bustling city steeped in history and culture. And it’s this harmonious mix of past and present that makes Kraków so special. In fact, Old Town and the district of Kazimierz were placed on the first-ever UNESCO World Heritage List back in 1978. Stare Miasto: Literally the ‘Old Town,’ Stare Miasto is the most central and historic quarter of the city. Krakow’s most popular attractions mostly lie in and around Stare Miasto, making it one of the best areas to stay in Krakow, and certainly the most convenient location for tourists. On the flip side, expect to pay more for accommodation if you want to be in this ultra central and very picturesque part of Krakow. Kazimierz: One of the coolest neighborhoods in Krakow, Kazimierz is the historically Jewish quarter of the city. Bustling with cafès, boutiques, galleries, and bars, Kazimierz is the best area to stay in Krakow if you’re looking to discover the cool and bohemian side of the city. From Stare Miasto’s central square (Rynek Główny) to Kazimierz, it’s about a 20-minute walk. Kleparz: Located directly north of Stare Miasto, Keparz is a good area to stay in Krakow if you want to be central, while still avoiding the biggest crowds. Mostly a residential neighborhood, Kleparz will also offer you insight into everyday life in the city. Grzegórzki: At first glance, Grzegórzki can look rather grey and run dow, but there are some gems hidden beneath if you’re willing to look! With a good selection of budget-friendly hotels and holiday apartments, and traditional restaurants where delicious food is guaranteed, this area is also home to a botanical garden and an interesting flea market. Podgorze: Podgorze is a residential area with an up-and-coming vibe. There’s enough here to keep you busy for a whole day, and it’s off-the-beaten-path enough that you’ll have much of it to yourself. If you’d like to stay in an area filled with locals and don’t mind being further from the centre, this could be a good bet. The accomodation we’ve listed in this section is within a 20-minute walk from Kazimierz. Ludwinow: Set on the banks of the river, Ludwinow is often overlooked by tourists, but has a hip vibe that will appeal to some. If you’re on a budget, you’ll find prices in this area are more manageable…and you can spend your saved cash hanging at the artificial beach. Other Krakow Neighborhoods to Visit: While these neighborhoods probably won’t suit most visitors as a best place to stay in Krakow, Salwator, Zakrzówek, and Nowa Huta might be worth exploring or considering if you have extra time, or are coming to Krakow for a longer stay. So….Where Should You Stay in Krakow (A Summary)? Photo Credit & Copyright: Charlotte Døvle. Used with permission. Old Town is the hub of tourism in Kraków, and for good reason. At its heart lies Rynek Glowny, the largest medieval market square in central Europe. Here you can buy flowers, souvenirs and amber jewelry, which Poland is known for. Sit down for a drink at one of the many outdoor restaurants that line the square and enjoy the magnificent view of St. Mary’s Basilica. And be sure to check out the high-tech underground museum that offers free admission on Tuesdays. Many of the restaurants and bars in this area are geared towards tourists, and therefore are comparatively quite expensive vs. what you’d pay in other areas. There are, however, two gems I can recommend: an Italian restaurant called Trattoria La Famiglia and an authentic Mexican restaurant, Albriche. There are two of my absolute favorite restaurants in Krakow. Just west of Rynek Glowny, perched on top of a hill overlooking the Wisła river, sits the majestic Wawel Castle. Maybe the most iconic of all of Krakow’s attractions, entrance to the castle grounds are free, and for a small sum, you can also explore the “Dragon’s Den,” which is actually quite fun. Kraków’s largest shopping mall, Galeria Krakowska, is just east of old town. Be warned, it is extremely crowded and can be quite tiring to visit, but is a good stop if you need something. My tip is to jump into a taxi and go to Bonarka City Center, just 10 minutes away, if you don’t like crowds. It is another huge mall, but has far fewer people and a much calmer atmosphere. Hotel Stary – A 5-star property in a renovated 14th-century building, this hotel has a contemporary boutique feel that incorporates original building features. Rooms are elegant and comfortable, with air con, both a bathtub and shower, TV, free internet, and L’Occitane toiletries. The on-site sauna, swimming pools and rooftop bar get top marks. Just in front of the main square, it’s a 15-minute walk to Wawel Castle. Hotel Imperial – The colours, furniture and details at this 4-star hotel channel an old world, aristocratic vibe with a modern twist. Rooms are spacious and bright, with TVs, bathrobes, slippers and nice toiletries for relaxing. Free Wi-Fi and a on-site restaurant for convenience, with past guests consistently mentioning the great location (although, the entrance is a bit hard to find at first). The Main Market Square and the Town Hall Tower are a 1-minute walk away. Hotel Wit Stwosz – A small 3-star hotel in an old building, this place gets rave reviews from past guests for comfort, cleanliness, staff, and location. Most rooms are quite large, and have traditional-style furniture and décor, high ceilings and large windows. While the décor looks slightly dated, several reviews describe this place as “faultless” and previous guests consistently mention the friendly staff that go above and beyond. A 2-minute walk from the main Market Square. Hotel Wentzl – Located right on the square and providing gorgeous views, this 4-star property is in a 15th-century building decorated with Polish art. Rooms have free Wi-Fi, TV and DVD, Nespresso machines, and robes and slippers, and the on-site restaurant has been in business since the 18th century! Right on the main Market Square, it’s hard to beat the location. Past guests consistently mention the luxurious vibe and great staff at this place. Hotel Gródek – A 5-star boutique with a charming, cozy ambience to it, this hotel sits on a quiet street 2 blocks from the Market Square. Rooms are individually decorated with a traditional feel, and feature air-con, TV and Wi-Fi, and a kettle and mini-bar. Bathrooms have heated floors – a bonus in the winter. The hotel has a sauna and an on-site restaurant and past guest mention the good breakfast and young, friendly staff, as well as the cozy bar with fireplace. Flamingo Hostel – If you’re looking for something that’s easy on the wallet, this newly renovated ’boutique’ hostel offers both privates and dorms in a 17th-century building. Rooms look bright and fresh, Wi-Fi is free, and past guests mention there are lots of charge points for devices. Great location for enjoying nightlife, but it can get noisy, so pack earplugs. Less than a minute to get to the Market Square. Note: past guests have mentioned it can be hard to find. As the home of one of the world’s most significant Jewish communities, Kazimierz was targeted and systemically destroyed during WWII. In the decades up until the 1990s, it was also one of the dodgiest areas in the city. Since its rediscovery, however, Kazimierz has become Kraków’s coolest and most exciting neighborhood. It is rich in history and bustling with bohemian bars, restaurants, boutiques and galleries. It is also home to the impressive Corpus Christi Church: be sure to take a look inside! The Jewish community has also recovered, and is today flourishing with the colorful Jewish Square and numerous synagogues throughout the city. Plac Nowy is a market by day, and the center of nightlife in Kazimierz after dark. The perfect evening out starts with dinner at Plac Nowy 1, followed by drinks at Alchemia, a bar that takes its inspiration from a traditional Polish living room. For dancing, hit up Le Scandale, just next door. Dada Boutique Home Hotel – A 4-star boutique with a modern, luxurious and cozy interior, the relatively-new Dada gets high marks from past guests. Featuring a sleek interior with rich woods, neutral tones and design touches, the décor has a ‘wow’ factor that past guests seem to love. Rooms have air-con, free Wi-Fi and TV, and a kettle for tea, and bathrooms get top marks. A 5-minute walk from the heart of Kazimierz, and about 15 minutes to Wawel Castle. Metropolitan Boutique Hotel – A 4-star with a fresh and contemporary look to it, past guests give this property high marks for clean, comfortable rooms, friendly staff, and great location. Rooms are air-conditioned with firm beds, free Wi-Fi, TV and floor heating in the bathroom. There’s an on-site fitness centre, and bar and restaurant seem to get good reviews. A 6-minute walk from the heart of the Jewish Quarter, and less than 15 minutes to Old Town. Aparthotel Miodowa – If you are looking for something a bit more spacious, or would like a kitchenette for some at-home basics, the Miodowa seems like a good bet. Suites are spacious and bright, and offer Wi-Fi, TV and DVD, kitchenettes, and bathrooms with a hairdryer and toiletries. Parking and laundry service are available, as well as an on-site restaurant. Located on the edge of the Jewish District, past guests mention it’s an easy walk into the Old Town as well. Queen Boutique Hotel – A 4-star boutique with a bold black and white interior, bright rooms, and nice use of the original brick, this upscale hotel features a sauna, spa, and on-site restaurant. Past guests comment on comfortable beds and under-floor heating in the bathroom, as well as helpful and friendly staff. Rooms have air-con, Wi-Fi and TV, tea making facilities and robes. Market Square is less than 10 minutes away, and the centre of Kazimierz is about 5 minutes’ walk. Hotel Columbus – A 3-star hotel with a traditional look and feel, the interior here is full of rich colors and dark woods. Past guests mention the spotlessly clean rooms and great staff, and some suggest this place deserves more than 3 stars. Rooms have air-con, free internet and satellite TV, but lack tea/coffee facilities. It’s possible to schedule a massage at the hotel, and there are loads of bars and cafés nearby. Tempel Synagogue is about a 5-minute walk; 15 to old town. Good Bye Lenin Hostel – Not all hostels are created equal, and this one has quite the personality! Decorated with a communism theme — think socialist posters, liberal use of the color red, and Lenin portraits — this place offers both dorm rooms and privates. Past guests seem to like the iron curtain vibe and friendly atmosphere, but note it’s also in need of a bit of a facelift. The hostel features a bar, a garden and hosts free barbecue evenings, and is about a 10- to 15-minute walk to old town. Kleparz is a small, mostly residential and upscale neighborhood located directly north of Old Town. Here you will find Kraków’s oldest and most colorful market, Stary Kleparz. Locally grown vegetables, fruits, flowers, cheeses and meats are available fresh every day at bargain prices. Other landmarks worth noticing in the area include the gorgeous St. Florian Church and Jan Matejko square. Still very convenient, Kleparz is a quieter alternative to Stare Miasto. Puro Kraków Stare Miasto – A bright, fun and design-forward 4-star, we personally choose to stay in Puro hotels whenever we’re in Poland. The lobby has a fun, colorful vibe, and rooms have large windows and bright interior accents. Past guests love in-room tablets to control temperature and lighting, free coffee and tea at the reception, and on-site bar and lounge area. 8-minute walk to the edge of Old Town, and 15 to the Square. Very convenient to the train station (3 minutes). Mercure Krakow Stare Miasto – Another tried and tested chain hotel, this 4-star Mercure boasts historic touches and unique colorful details throughout, channelling a design hotel vibe. Rooms are bright and modern, with free Wi-Fi, flat-screen TV and updated bathrooms. There is a fitness centre, restaurant, and wine bar on-site as well. Past guests rate this property highly, and it’s in a convenient location to the train station and Old Town. Hotel Indigo Krakow – Old Town – Another design hotel with loads of personality, this 4-star features gorgeous brickwork and wood, quirky design touches, and bright and colorful details throughout. Rooms are on the small side, but are quite beautiful and feature free Wi-Fi, satellite TV, bathrobes, and a hairdryer. The hotel has a sauna, fitness centre, an on-site restaurant and a sleek bar with a variety of drinks. St. Florian’s Gate and the edge of Old Town is at 4-minutes walk and the train station is 5 minutes away. The large neighborhood just east of Kleparz and Stare Miasto is called Grzegórzki. At first glance, this area looks really gray and run down. However there are some places worth visiting, you just need to know where to look. Take a stroll from Kraków University of Economics to Kraków Opera House and the Botanical Garden of Jagiellonian University, and you’ll get a feel for the neighborhood. One other thing that can be fun to check out in Grzegórzki is Hala Targowa, the city’s most eclectic outdoor flea market. Visit on a Sunday for the best selection of everything, from old antiques to questionable underwear. And if you want to try a dish the locals love, find the Blue Van serving up grilled Kielbasa every night next to Hala Targowa. Kielbasa is a traditional Central European sausage usually served with a roll and condiments…delicious. Hotel Batory – A small family-operated 3-star in a quiet area, this property has a cute, traditional look that reminds me of time at a cottage…or at Grandma’s house. Free Wi-Fi, satellite TV, heating and private bathrooms in the rooms, and free parking available if needed. The on-site restaurant serves international and Polish cuisine, and past guests mention the staff are friendly and helpful at arranging tours and giving tips. Main square is a 15-minute walk, and Wawel Castle is about 30 minutes on foot. Galaxy Hotel – A 4-star on the river, this hotel offers bright and clean rooms with air-con, TV, and in-room tea and coffee facilities. The hotel offers a spa centre, swimming pool, fitness centre, 2 bars and an on-site restaurant with a view over the river. Past guests mention the cleanliness, location and friendly staff. Kazimierz is a 15-minute walk, and the Main Square is about 30 minutes on foot, or an affordable taxi ride. Old Town Friendhouse Apartments – If you prefer the comfort of an apartment, these spacious apartments offer a bright and modern option, with light wood, pops of colour, and brick details in a modern building. Each apartment has a private bathroom with shower, dining and sitting area with a flat-screen TV, and a kitchen equipped with basics such as a toaster, kettle, oven and fridge. A 15-minute walk to Old Town square, and 15 to the train station as well. A district full of history, beauty and a couple of unusual attractions, Podgórze has long been thought to be the next big thing after Kazimierz. And since the construction of a footbridge creating direct access to and from Kazimierz, more people have started to take notice of Podgórze. That said, I still think it is Kraków’s most under appreciated neighborhood. With plenty to see and do, you could easily spend an entire day exploring this area. Start with a walk along the river boulevards, check out St. Joseph’s church and Ghetto Heroes Square, a large monument consisting of 70 cast iron and bronze chairs that commemorates the tragic fate of Kraków’s Jews during WWII. It’s a very powerful sight I think most tourists miss. Continue with a visit to Schindler’s Factory and a walk up to Krakus Mound for one of the best sunset spots in the city. Finish the day with a Mexican feast at Manzana, one of my favorite restaurants that just moved to Podgórze from Kazimierz. A tip is to treat it as you would a tapas place, and order one of every appetizer. I promise, your taste buds will thank me! Qubus Hotel Krakow – A 4-star in a quiet location right next to the river, the stand-out feature of this large hotel is the rooftop pool and hot tub with views of the city. Rooms are air-conditioned and have satellite TV, free Wi-Fi and comfortable (soft) beds. Past guests mention this hotel offers great value for the price, and seem to enjoy the range of facilities, including gym, sauna and great breakfast. The hotel offers free seasonal boat trips to Wawel Castle (!) and Kazimierz is 10 to 15 minutes on foot. Aparthotel Lwowska 1 – A pet-friendly complex with 167 colourful suites, this aparthotel is funky and modern with bright interior accents and a sleek, boutique vibe. The property is air-conditioned, and each private unit features a flat-screen TV, private bathroom with towels and slippers; and a kettle. There’s an on-site restaurant, sauna and spa, as well as parking. A 15-minute walk from Kazimierz, and 5 or so minutes from the Schindler Museum. Chilli Hostel – A clean and colorful hostel, you can choose from a dorm room, or a single, double, or triple room. Offering free Wi-Fi and tea/coffee, and nice common areas, past guests mention the staff is extremely friendly and always happy to arrange a trip or tour for you. The hostel is about a 20-minute walk from Kazimierz, 5 minutes on the tram to the centre, and 12 minutes on foot to the old Forum communist hotel – turned – bar/café. Ludwinów is a neighborhood within the district of Debniki, set on the bank of the Wisła River across from Wawel Castle. It has undergone major development over the last decade, resulting in an artificial beach, new hotels and a conference center. For a hip and delicious meal, you should visit Forum Przestrzenie, a cafe located in the reception area of the old communist building, Forum Hotel. In this area, you’ll also find one of the most unique and affordable accommodation options in the city, a boat hostel on the river called Marta. Park Inn by Radisson Krakow – A modern 4-star with a bright and bold color scheme, this property offers the comforts and amenities of a mid-range chain: underground parking, fitness centre, sauna, and on-site bar and restaurant. Rooms are bright and spacious with air-con, free Wi-Fi, tea/coffee facilities, TV, and a seating area. Market Square is a 25-minute walk, and it will take about 15 minutes on foot to Kazimierz. Q Hotel Plus – A relatively new 4-star with a bit of a business vibe, this hotel gets high marks for value and staff. Rooms are air-conditioned, and have free Wi-Fi, TV, tea/coffee facilities and nice bathrooms. There is private parking if you need it, and an on-site restaurant. From the hotel, it it’s about a 20-minute walk to Kazimierz, or a €5 taxi ride to the central square. Hilton Garden Inn Krakow – A 4-star near the river and overlooking Wawel Castle, this property is clean and modern in a quiet area. Air-conditioned rooms have satellite TV, free Wi-Fi, tea/coffee making facilities, a fridge and a working area, and guests can visit the 24h fitness centre, on-site restaurant and 24h shop. From the hotel, it’s a 20-minute walk to Kazimierz and 30 minutes to the main square. If you want to get further off the beaten path than our suggestions above allow, consider checking out some of these alternative neighborhoods. Most of these aren’t the best option for the casual visitor, but they could work well if you have a special interest, want to throw yourself into local life, or are looking to stay in Krakow longer term. Salwator: Picturesquely set on the western outskirts of Old Town, Salwator offers a relaxing break from the city’s busy tourist areas. The affluent neighborhood is a green oasis compared to the rest of Kraków, but for some reason rarely visited by tourists. The area’s main attraction is the bright green Kościuszko Mound and surrounding fortification. But the path out from the city centre along Wisła river is an experience in itself. It’s the perfect warm-weather activity. While you’re at the top of the mound, turn to the opposite direction of Old Town and you’ll see Camaldolese Monastery and Kraków Zoo in the middle of Wolski Forest. Salwator can be accessed by trams 1 or 2 to the Salwator roundabout, but I also recommend renting a bike and taking the scenic route. Zakrzówek: Zakrzówek is the neighborhood directly behind Ludwinow, again only a 20-minute walk from Wawel Castle. Zalew Zakrzówek, a turquoise lake in an old limestone quarry, is the reason why I think this area is worth visiting. You won’t believe the color of that water! A true hidden gem very few tourists know about, the lake is easy to find on foot or on a bike, but you can also get there with tram 18 to the Norymberska stop. Nowa Huta: 20 minutes east of the city center lies the suburb of Nowa Huta, a remnant of Poland’s Communist past. As a result of several revitalizing efforts over the last decade, this part of town is now starting to be appreciated by both locals and tourists. There are many tour operators offering communist tours out here, and if you’re interested, the Viator is a good place to start. Cruising around the area in one of the old and colourful Trabant cars seems to be a particularly popular and fun way to see the neighborhood! To get there by yourself take tram 4 from Dworzec Główny (the stop by the train station) to Plac Centralny which is the center of the neighborhood. So Where Should You Stay in Krakow? If you’re visiting for a short city break, or it’s your first time in the city, Stare Miasto and Kazimierz are probably the best areas to stay in Krakow. Whenever friends and family ask me where they should stay in Kraków, I personally recommend Kazimierz first. It has been my favorite neighborhood in the city since my first visit over six years ago. Even though it has become more touristy in recent years, it still has its charm, and there are so many great bars and restaurants to choose from. There can, however, be a lot of noise from people in the streets who want to keep the party going into the early hours. So if a calm and relaxing stay in a higher-end neighborhood is what you are after, Kleparz is one of the best areas to stay in Krakow. Kleparz has the benefit of being close to Old Town, while being just far enough away that it’s far less touristy. And lastly, for all visitors, I would suggest to first explore Old Town and Kazimierz and then work your way out starting with Podgórze. If you are visiting during spring or summer, you should rent a bicycle and ride along Wisła river to Salwator. It is stunning! 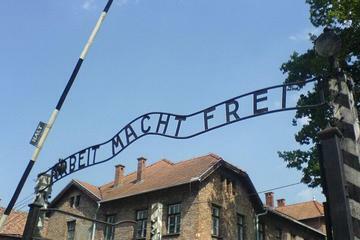 Krakow, of course, is a popular place to base yourself for a visit to the Auschwitz-Birkenau concentration camp. You can read about our experience visiting here. Note, if I were to do it all over again, I’d probably take a tour, just to not have to deal with the transportation. It was a bit of a pain to get there, but not impossible. We’ve got a bit of ‘how to’ info in that blog post if you want to DIY. Sightseeing Bike Tour of Krakow — This 4.5-hour tour takes you through Krakow’s cobbled streets and past top attractions, such as Schindler’s Factory, and includes a guide who can tell you about the history of the city. Lunch at a traditional Polish restaurant is included – a great intro to the city! Krakow Evening Food Walking Tour — If you like good, traditional food, you will love Polish cuisine. This 2.5-hour evening tour will bring you to local eateries and bars to try the most traditional dishes, such as scypek cheese, pierogi, and Jewish delicacies in Kazmierz. All washed down with ‘bison grass’ vodka, of course! Auschwitz-Birkenau Museum and Memorial Guided Tour from Krakow — A full-day tour including round-trip hotel transport from Krakow and a professional guide that will show you the UNESCO World Heritage Site of Auschwitz-Birkenau and its memorials and stories. We’ve travelled to a few different cities in Poland (Krakow, Warsaw and Wrocław), and have never had any problems as English-only speakers. In general, people (especially the younger generation) in Krakow, Poland and Central Europe more broadly, are very open to tourists and speak a decent level of English if you need a hand. In our experience, even when people don’t speak English and we have no language in common, we’re still always able to find a way to communicate! That said, we understand the impetus to join a tour, especially if you’re short on time. As we tend to travel independently, we don’t have a tonne of experience with tour companies. However, there are enough reputable companies out there, that it seems you should be able to find a tour for any style of travel or budget. Companies like G Adventures, Trafalgar / Contiki / Insight Vacations (owned by The Travel Corporation), and Intrepid / Peregrine / Geckos (owned by Intrepid Group) seem to be a generally safe bet in terms of value and experience. the difference between the companies really comes down to their price point, and their target market, with Contiki and Geckos targeting the under 35 and backpacking market; G Adventures and Intrepid targeting mid-ranged small group travellers; Trafalgar offering more of a large group, escorted trip; and Insight Vacations focusing more on the luxury market. Intrepid currently offers quite a few Central Europe tours that include Poland, ranging from their 15-day Best of Central Europe Tour (which goes from Vienna to Budapest passing through Czech Republic and Poland) to the 29-day Vienna to Dubrovnik Tour which explores the Balkans region, as well. If you have more time on your hands, you can also take the monster, 43-day Madrid to Rome tour, and others in between. Check their Poland tours home page for more options and info. G Adventures‘ offering is a bit smaller, but they have 3 options (currently) that include Poland, ranging from 8 to 17 days. You can see more here. Trafalgar also has a variety of Poland and Central Europe itineraries. Their 11-day Highlights of Poland tour looks like a great option to fully experience the Polish culture and landscapes. Their 17-day Highlights of Eastern Europe covers lots of ground, exploring 8 European countries. They have many more options, which you can find on their Central and Eastern Europe Tours Page. With most attractions within easy walking distance from one another, the best way to explore central Krakow is on foot. You can easily walk around Old Town, Kazimierz, Kleparz and Podgórze all in one day. If you want to venture a little further out and the weather allows it, you should do it on two wheels. 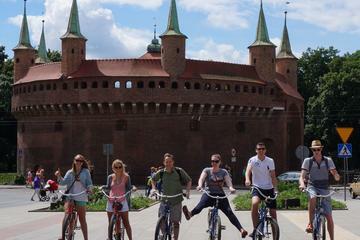 Bikes are available for rent at many locations throughout Old Town and Kazimierz. Another cheap and efficient option is public transport. Trams and busses operate all over the city and tickets can be bought at newsstands and from ticket machines at some stops and in most of the buses and trams. One-way tickets are 3.8 zł and a 7-day pass will only set you back 48 zł. Download the “Jakdojade” app for help to find the right lines and stops. If you are only in town for a weekend or so, you probably also want to use taxis to get around. Taxis in Kraków are plentiful and relatively affordable. Right outside the airport, there are fancy black cars operating with set prices depending on where in town you are going, Kazimierz is 79 zł, which is about $20 US at the time of writing. For this price, you can also pre-arrange a private transfer through Viator. More affordable taxis are not available from the airport unless you are able to snag one dropping someone off. In the city centre, however, you will find inexpensive taxis on almost every corner. Alternatively, it may be worth looking at the Krakow Museums and Transport Official Pass and take advantage of the unlimited transport pass and access to many of Krakow’s attractions. Our goal with this Where to Stay in Krakow Guide (and our Where to Stay in Vienna, Where to Stay in Bratislava, Where to Stay in Berlin, Where to Stay in Prague Guides…you get the idea) is to make a small contribution to your trip planning process, and hopefully help you have a better time in Krakow, with less research required. We figured the best way to do that was hire a local who knows the city well, but that comes with one small problem: locals don’t tend to stay in hotels. So, what we’ve done is choose hotels in the neighborhoods suggested by our local expert (Charlotte), using online review scores to find what we think look like the best options. Basically, we list the hotels that — based on the online research — we would personally stay in, or would be happy suggesting to a friend or family member. We haven’t personally been to these hotels, but we’ve asked ourselves things like: Have past guests left amazing reviews? Does it look like somewhere I’d like to stay? Does it seem to be in a great location for enjoying Krakow? If it ticks those boxes, we’ve added it to the list. Hopefully this info will help you have a better trip, but at the end of the day, we figure you’ll also do your own research. Suggestion Add a (Google) map overlay with each of the areas you outline in the article. Would be super helpful for tourists like me who are planning to visit Krakow for the first time and don’t know much about the city!